Because of the solar corona is optically thin in white light, the true 3D structure of Coronal Mass Ejections (CMEs) is concealed by projection effects: we can only observe the integrated emission along the line of sight. However, a knowledge of the corona in 3D is crucial for understanding the nature and origin of solar eruptions. In particular, it would improve our comprehension of the coronal structures that generate CMEs, of the magnetic topology of the erupting region (and thus the coronal magnetic field) and finally it would allow us to predict the trajectory of CMEs in the interplanetary space, increasing the safety of manned operation in space and of satellites in Space Weather. 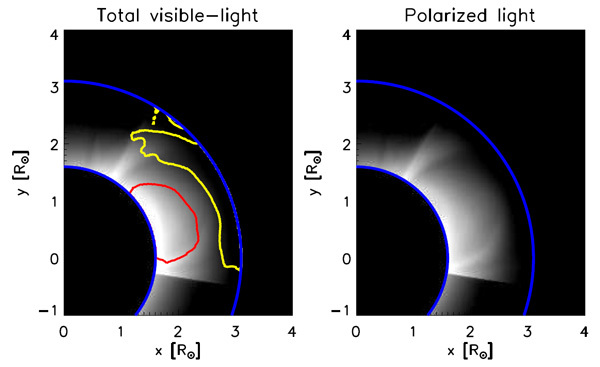 The polarization ratio technique  is widely used to derive information on the 3D structure of CMEs from white light images, both total brightness and polarized brightness. Future coronographs, like METIS on board Solar Orbiter, will use this technique to produce new polarimetric images . The polarization ratio technique utilises the fact that the polarized (pB) and unpolarized (uB) brightnesses from Thomson scattering have different dependences on the scattering angle, hence on the location z of the electrons along the Line of Sight (LOS). This different dependence on the angle allows the determination of the average plasma location along the LOS from the ratio pB/uB observed in single view-point images, with a well known ±z ambiguity due to the symmetry of Thomson scattering about the plane of the sky (z = 0). The aim of our study is to provide a key to correctly interpret the results from the polarization ratio technique and to estimate quantitatively the uncertainties connected to its application. Figure 1. Map of difference between the z position measured by the polarization ratio technique and the position of the “folded” centre of mass. To begin with, we assume a simple electron density distribution along the line of sight, consisting of a gaussian blob superimposed on a background quiet corona. We synthesise the expected total brightness (tB) and polarized brightness pB for different distances z of the blob in front of or beyond the plane of the sky, and different projected altitudes ρ above the solar limb. Reconstructed locations of the blob along the line of sight, found using the polarization technique, can be compared with the model positions. This allows a precise determination of uncertainties in the method. Figure 1 shows the differences between the determination of a CME position along the line of sight as a function of the projected position on the plane of the sky (ρ-x-axis) and the distance from that plane (z,y-axis). 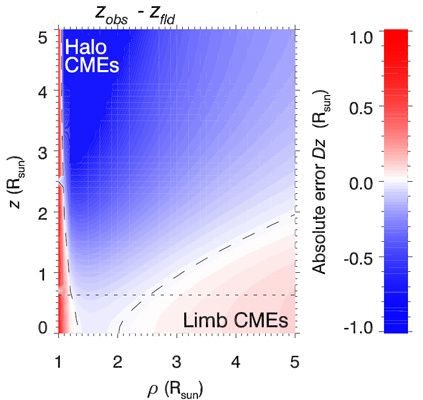 The plot shows regions where the distance is under(over)-estimated in blue (red) colours with respect to the ‘folded density centre of mass’. This is the centre of mass of the density distribution given by reflecting and summing in front of the plane of the sky that fraction of the density profile located behind the plane. With this simple application we find that when the blob is centred near the plane of the sky (small z), the distance from the plane of the sky is mostly overestimated. This is the configuration likely to occur when we observe Limb CMEs. But the discrepancies in this region of Figure 1 are relatively small. On the other hand, when the blob is far from the plane of the sky, but with very small projected altitudes (small ρ) the inferred distance from that plane is significantly underestimated (the configuration occurring in Halo CMEs). Better determination of the real blob position along the line of sight is given for intermediate locations, and in particular when the blob is centred at an angle of 20° far from the plane of the sky. We also perform a 3D MHD simulation of a flux rope ejection where a CME is produced [3,4] with the MPI-AMRVAC code . From the simulation we synthesise the corresponding METIS white light (total and polarized brightness) images. Figure 2 shows the synthesis of METIS white light images (tB – left panel) and of polarized light (pB – right panel) from the MHD simulation density distribution. The red contour indicates the position of the flux rope, the yellow contour the position of the ejection front and the blue lines identify the borders of the METIS field of view at the perihelion of the orbit of Solar Orbiter. Figure 2. Synthesis of METIS observations of white light (left panel) and polarized light (right panel) images from the MHD simulations. Figure 3. Maps of density with overimposed the clouds of points resulting from the polarization ratio technique (red crosses) and the cloud of points of the “folded” centres of mass (green crosses). We find that the polarization ratio technique captures the 3D cloud of points of the folded centre of mass with enough accuracy to describe the macroscopic structure, as the two clouds of points mostly overlap. Also the shapes are nearly identical when seen from both points of view. Our work gives accurate indications of how the polarization ratio technique works, and how we can use it to study the 3D structure of solar eruptions and to predict the direction of propagation of CMEs in order to support Space Weather forecasting.